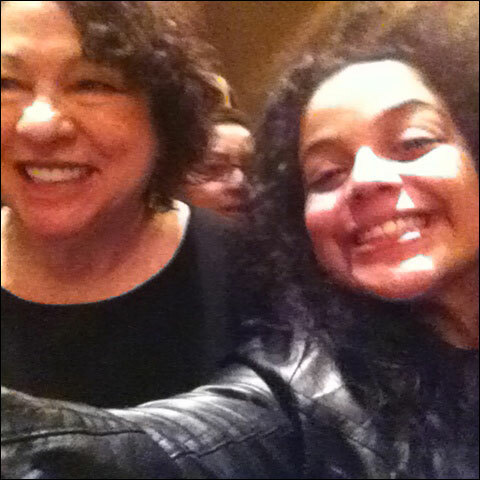 As the snow fell in New Haven on Monday, New Haven Promise scholar Anabelle Marty and Promise Executive Director Patricia Melton ventured to Woolsey Hall on the campus of Yale University to listen to a trailblazer — U.S. Supreme Court Justice Sonia Sotomayor, the first Hispanic to serve such a role. Both visitors are trailblazers as well. Now a sophomore, Marty was the first graduate of Achievement First Amistad High School to enroll at Yale while Melton recently became the first African-American female to receive the George H.W. Bush Leadership Award from the University. As she came onto the stage, the entire congregation of people that was there rose to give Justice Sonia Sotomayor a standing ovation. That scene reminded me of everyone’s response on Senior Signing Day when I revealed that I was going to be attending Yale University — at that moment, I saw myself in Justice Sonia Sotomayor. I recall experiencing a similar emotion when I visited Yale during Bulldog days — instead of staying for the entire duration of the visit, I packed my bags and (literally) walked home with tears staining my cheeks. I was afraid. I was afraid of this place called Yale. Ultimately, though, I wanted to conquer that fear and the only way to conquer it was by attending this institution. One of the aspects of Justice Sotomayor’s talk that impacted me the most was her insight about how she managed to juggle her identity at home and her identity at Princeton. “Sometimes, I feel like I am not part of either worlds entirely.” Being a native from New Haven and attending Yale, I grasped exactly what Justice Sotomayor meant by that statement. Because these two worlds of mine seem to be disconnected at times, I find myself vacillating between them and, ultimately, not knowing where I belong. However, Justice Sotomayor’s talk and presence helped me realize that the wrestle between these two worlds of mine is slowly creating a piece of art in my life. After her talk, I felt moved to start asking more questions about the world, to take advantage of the amazing opportunities Yale offers me, and to learn how to blend my “home identity” and my “college identity.” When President Obama asked Justice Sotomayor to promise him that she would stay connected to her “roots,” she humbly responded, “I do not know how to do anything else but stay connected to my roots.” In the midst of all that life grants me, I, too, want to remain rooted in the “ground” where I sprang up from. With the inspiration of the Justice, expect Anabelle Marty to continue her trailblazing tradition. This entry was posted in Students by New Haven Promise. Bookmark the permalink. Truly inspirational! I am always touched when I hear/read stories like this one. May you continue to grow and prosper in your educational endeavors! Aww Anabelle this is beautiful! Thanks for sharing.